How much is your spirit worth? available May 2nd . . .
1,150 backers pledged $21,595 to help bring this project to life. If you missed this Kickstarter, check subquark.com for availability. 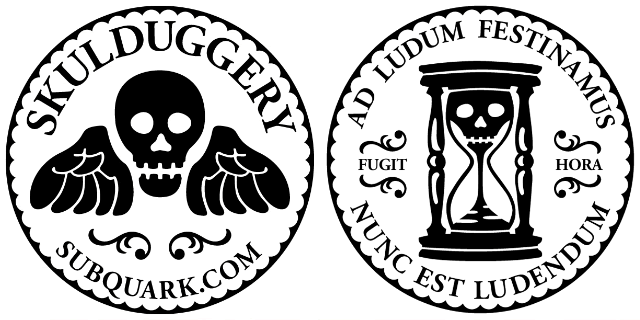 Mint Tin Mini Skulduggery will be available online after these rewards have been sent out. Expected general availability in late spring or early summer 2019. A 1-4 player dice game that plays in 10-25 minutes with challenging solo play—play up to 8-player with two games. All games will be signed by Kate & David. Full rules below. Gamesosity.com picks us as one of Jess’s Fave Five Kickstarters of the Week and says "I love the little skulls in Mint Tin Mini Skulduggery. " Active board game geek & like this game? 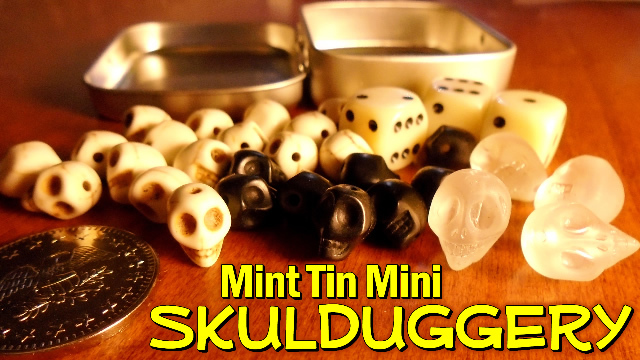 Vote on Mint Tin Mini Skulduggery here. We were having so much fun playing this little game as we developed it that we decided to meet with friends for lunch to see how they liked the game. The skulls are an intriguing component of the game and having Skulduggery hanging over you makes the tension perfect. Hoping for a good reaction from our friends, we ended up with a terrific one! We had so much fun as we played that we attracted strangers to our table. Our explanation of the game ended up with them joining us to play. We made new friends thanks to the game, which is not only fun but has the effect of making everyone feel happy. One of the places (a brewery) was interested in purchasing the game to have for their customers, what a great testimonial! We hope to pass on the fun and happiness to you, enjoy! All our Mint Tin Games are tough, even tough enough for roller derby refs! Invoke spirits of the ethereal realm to help you roll your way to victory, shatter the rolls of opponents, and push your luck without unleashing skulduggery! It's a centuries-old dice game with modern twists making it contemporary for today's tabletop gaming community—the oldest name we've found for it is Läjähtää (Finnish for slam). This modern-day interpretation has a deterministic element—the mystical crystal skull—to offset the luck-driven nature of this age-old game. Unleash the crystal skull to foil an opponent, stave off Skulduggery, or gain victory at the last moment. We've added tiny stone skulls for scoring and a winged death head coin as a pretty unique game mechanic—and a pretty rotten one too—it's pleasantly wicked and nearly nefarious. It's a nice way to unwind, connect with each other, and take a break from the hectic that life can be. It's a light and addictive dice game for easy stress-busting fun (unlike its frenetic cousin Mint Tin Mini Apocalypse). It's so small and so easy to carry, we love playing when we're out for a bite to eat. We hope you like it too. Like our other games, Mint Tin Mini Skulduggery is maker-to-player and this game's made in the USA (on a dining room table in New Hampshire). And since we don't do offshore manufacturing, we search for existing and innovative components, such as this game's stone skulls. Let's take a look at how this game plays to see if fits your gaming needs—because you should only back games that do. Summon the spirits to help you roll winning dice to collect points. A single spirit's one point, two are five, and three are ten (and very rare). In these pics, three is the spirit number. Shatter a spirit die with your crystal skull and end your foe's turn and force them to roll with fewer dice. In the above, five points became one and since a spirit die is still showing, they continue to roll, but only with two dice. You can even form alliances if you think that's a good idea . . .
Special rolls—low-straights (1-2-3) and high-straights (4-5-6)—give points to low scoring players or take points away from high scoring ones. Spirits frown upon runaway leaders and sometimes favor the underdogs. Triples are powerful and can return your crystal skull from the ethereal realm and get points. But if you can't take advantage of a triple, the hourglass comes out, and the spirits will threaten to reign skulduggery down upon all of you! If you don't banish the hourglass and think you can push your luck, the Winged Death Head may appear and then all of you will suffer Skulduggery! Delve into the full rules, including the challenging solo mode, on our subQuark site. There's even a tiny advanced mode mod. Or grab the PDF here. This ages-old game has always been played with three dice—that's all you really need. But . . . we've added some fun components while keeping it incredibly portable. We play test a lot when we're out for a bite to eat and the stone skulls catch people's attention—it's like being a board game ambassador. Stone skulls—white ones for 1 point each, black for 5 points, and glass skulls. The stone skulls are made from the mineral howlite which is similar to turquoise. In fact, howlite's popular for jewelry and these skulls are actually beads. The mystical crystal skull is a bit bigger and made of glass because of its special power and strategic nature. It's cool too because the glass is matt-finished but the eyes and mouth are shiny and clear. A nickel-plated minted solid brass coin makes Mint Tin Mini Skulduggery unique, like the hand-pressed tin, PLUS the coin can turn your best game into your worst, or vice versa—SKULDUGGERY! The coin's made on 150-ton presses at the oldest private US mint. Most game "coins" are molded from melted zinc. But real coins, like you might have in your pocket, are minted. Our mint makes coins for car washes and game arcades that see heavy-duty daily abuse in metal vending machines and they're meant to last a lifetime. And so will your Winged Death Head coin. The hard-working dice—Chessex dice of course. We've shared over 30,000 Chessex dice with tabletop gamers in 49 countries—they're the only dice we use because they feel great to roll and last forever. For Mint Tin Mini Skulduggery, we use three 12mm ivory-colored d6 with black pips as a nod to the game's heritage. The game box—a hand-stamped seamless hinged steel tin—which can even be stored on the fridge with a magnet! We design our own embossing plates and we've prototyped several and now a pair of 3D-printed stainless steel embossing plates are on their way to use for hand pressing your game's lid. The tin measures 2.3 x 1.9 x 0.5 inches (5.8 x 4.8 x 1.3 cm) and is about half the size of an Altoids tin. We use an arbor press and enjoy this hands-on, maker movement, and personal step—it's a truly rewarding labor of love. If you carry your game around, like I do daily, expect the tin to get beat up. To me, that means I'm having an awesome life with time to spend sharing fun with friends. The dents you'll most likely see will be from the inside. When closing the tin, get all the pieces to lay flat below the rim of the tin and gently close. If it touches any game pieces, gently shake it to try to get things to lay flatter. But even with this attention, I inevitably end up with a skull making an outward dent. Maybe it's the power of the spirits trying to free themselves from the ethereal realm! The back label. Okay, not so exciting but we voluntarily exceed U.S. Consumer Product Safety Commission standards. It lets us track the complete manufacture of the game—from the coins in Ohio to lid pressing in Portsmouth. It's a durable exterior-grade vinyl sticker made to last (mine from Mint Tin Mini Apocalypse been through the wash four times and in-and-out of my Levi's watch pocket every day for three years—of course, we don't recommend washing your game, despite the Cheetos dust). Asymmetrical label - easier to apply & full of Skulduggery! A linen-finish French casino-grade card will have the official Mint Tin Mini Skulduggery logo and a quick reference guide. It doesn't fit in the mini tin but it's an easy way to refresh yourself on the special rolls. And it'll be sleeved in an acid-free Ultra-Pro Deck Protector Sleeve (110 microns). Upgrade! Checking the quality of 330gsm German card stock, looks and feels nice. Mini Update Nov. 26th: We're checking out a German, black core, 330gsm "superior smooth" card. Once we see the samples, we may upgrade to it. Why the change? Supposedly this "superior smooth" yields better contrast and crisper graphics while being a better quality over the 310gsm linen we typically use. Since this isn't shuffled, maybe that makes sense. But we'll decide first-hand and, even though it's a bit more expensive, we always want to use what's best for the long term. That's right—well . . . sort of. This game's full instructions are online as a mobile-friendly web page, as a PDF at the end of the Kickstarter, and a quick reference guide. We include a quick reference guide with your game but it doesn't fit in the tiny tin. We don't think you'll need it after you play it once. You'll probably understand it after reading the official Mint Tin Mini Skulduggery rules when you check out if this game's right for you. There's no point in backing a game, even an economical one built to last a lifetime unless you'll enjoy playing it. The Kickstarter exclusive Print and Play. This reward lets you follow the Kickstarter if you aren't sure about backing it yet. Some of you Print and Play peeps create outrageously awesome versions of our games and we're honored that you pour your passion into them. Once the Kickstarter's over, you'll get the download link for the PDF instructions, the high-resolution art files used for the tin, tin label, and winged death head coin. Everything you need to kick back, chill with friends, and have some easy fun with one copy of the Mint Tin Mini Skulduggery game. And you get the full PnP PDFs too. You get two copies of the Mint Tin Mini Skulduggery game. Be awesome and give one as a gift. Or keep one in your desk or car. Heck, combine two games for 5- to 8-player action! Plus you get the full PnP PDFs. 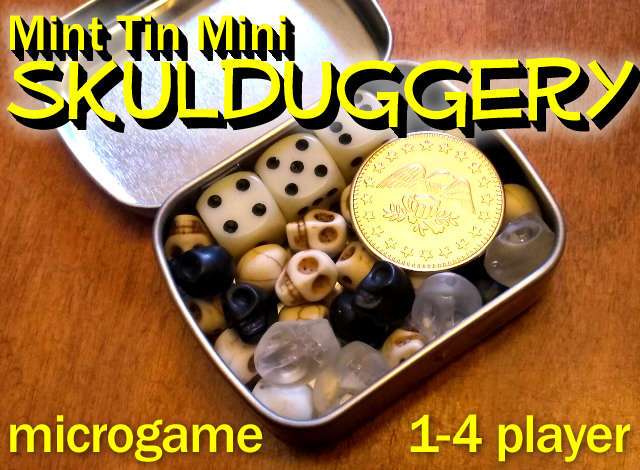 Get four copies of Mint Tin Mini Skulduggery. Butter up several friends with thoughtful gifts or stash them in your camping gear, fall-out bunker, or wherever. And you get the full PnP PDFs too. This reward's a great value for a group buy with total final cost per game, including shipping, that's close to the US single game reward. Get ten copies of the Mint Tin Mini Skulduggery game. What a fantastic club or group buy! The cost per game, including shipping, gets it below the US single game reward. And you get the PnP PDFs too. We had one backer of Mint Tin Mini Apocalypse use her group buy as wedding gifts—now that must have been a fun wedding! Nothing says love quite like the apocalypse or, in this case, Skulduggery! Nope, while stretch goals can add excitement to a project, we think they're sometimes a bit contrived. If the game should have a metal coin, then make it that way. We thought about making the coin a stretch goal and maybe doing a chipboard token. But those don't last, especially for a game you can actually carry in your pocket or bag. The components in Mint Tin Mini Skulduggery are tough by nature. You'll beat up your tin long before the dice, skulls, or coin wear out (if they ever do!). We calculate shipping for each reward to minimize postage and maximize protection with the shipping materials we use. Rather than do "add-ons" as part of your pledge, see the backers-only update. Supplies are limited but we hope to have enough on hand to meet your needs. For the US, these should make it before Christmas if you order by November 30th. International orders vary greatly with some delivering within a week and some as long as six weeks (we've had two that took 8 weeks to Sweden—that's not many out of thousands of shipments, but if one is yours—that stinks). Please plan accordingly and don't assume they'll be on time—we wish we could control that but customs is typically the sticking point as to why some deliver sooner than others (we've found this to be true of all countries, not just Sweden). You'll receive tracking info and that only works as well as your country's integration with the USPS system. Even though we "hide" the shipping cost where we legally can, the postage is in the barcode and is sometimes added to the declared value—it's up to your Customs. You're responsible for any VAT, GST, customs duties, or other taxes your country may impose. Of course, we think that the value added to your gaming library is tremendous for Mint Tin Mini Skulduggery, but paying tax on fun is anything but fun. If you need special shipping, such as a confirmed signature, we'll find out the cost from the USPS and then ask you for that amount. Send a message with your requirements, we'll let you know the amount, and you'll pay via PayPal. We love Kickstarter. Regular people can share their dreams with all of us and that's why you'll see that we've backed over 700 projects—we wouldn't expect people to support us if we didn't support them. It's a great community. Keeping this close to home is key for this maker-to-player project. We source in the US with dice from Indiana, plastic bags from Ohio, tins from New Jersey, labels from Rhode Island, minted coins from Ohio, and shipping supplies from Wisconsin. It all comes together in Portsmouth, New Hampshire—on a dining room table (and pretty much the entire house). But none of this happens without you. Thank you for checking this project out. You can use these images (and any on this page) if you'd like to share the word about this project. The images below can be saved with a right-click or, if you click them, they'll open a new window with the subQuark.com image. But our games are in Diversions, our awesome and supportive friendly local game shop, in their Portsmouth, New Hampshire and Portland, Maine locations. We're deeply honored to be with them. This Kickstarter's all about fulfilling your rewards—getting Mint Tin Mini Skulduggery into your hands first. A second printing will be available in the subQuark online shop at a later date and at a higher price. From our past Kickstarters, we've donated games to troops, veterinary fund auctions, and children's hospitals. This was possible through generous over-pledging which we match. If you over-pledge, we'll assume it's for donations and match it to make copies of Mint Tin Mini Skulduggery to donate—thank you—you do make a positive difference. Thank you for checking out this project and sharing the word. Our other games, Mint Tin Pirates, Mint Tin Aliens, and Mint Tin Mini Apocalypse, are registered with the US Copyright Office. And Mint Tin Mini Skulduggery will also be made immortal in this way. It's kind of cool because a copy of each game is permanently archived in the US Library of Congress. Home crafted games are our hallmark. Our games are made by the two of us, Kate and David. Once play tested, we source components domestically, inspect every part, and assemble each game in our home. It gets crazy but it's also deeply rewarding and that's because of you—you make this fun—thank you. Thank you to all of you who constantly nurture us and provide wonderful support via social media. Your words and pics spur us on and have produced this Kickstarter. Thank you, we are humbled by your passion and generosity. Solo play and walk through video: Nick Shaw, long-time friend and game expert, he's created popular variants for our games and lends his insightful talents to this game. His solo rules are very fun! Rules integrity: Natalie Miller, her ability to imagine unusual scenarios has clarified obscure but real game situations leading to better rules and more focus for the game. Plus a nifty animated GIF! Editing: Jodi Labonte, our editor bar none, I cannot say enough about her passion, talent, and patience with us. Thank you Jodi. Latin: Andrew de Alvare, fellow game designer and Latin expert. Andrew created the perfect Latin phrases for the coin. The winged death head figure comes from 18th century New England gravestones. Many were inscribed with Fugit Hora (time flees) and to give your Mint Tin Mini Skulduggery coin a relevant game reference, we added Nunc Est Ludendum (now is the time to play). We also use Ad ludum festinamus (we are hastening towards the game). An old US-version of this game, known as Buck, goes back at least to the 19th century as a dice game to pay for rounds of drinks. Dice and beer—not a bad combo! Did you know that there are over 1,800 Craps books on Amazon? A pure luck-driven dice game! Mint Tin Mini Skulduggery's cheaper than many of those books and it's a game that'll last a lifetime without breaking the bank! Prototyping the embossing plates takes several rounds of 3D-printed high-detail plastic models. Once those work on doubled heavy paper (32 lb), it's time to have the stainless steel plates 3D printed. It's a slow go since it takes about 10 days for each cycle and it takes me a few cycles to get it right (there's variation between the plastic and steel printing that's challenging to account for). If you're into metaphysics, the mineral howlite reduces anxiety, tension, and stress, and facilitates awareness and emotional expression. I'll take an extra helping of that please! At the start, they may come out every few days but then they'll taper off for bigger announcements (and some will include recipes, see the last Kickstarter for pics and how-to for a grilled bacon lobster sandwich and yummy mushroom quesadillas). It's easy to get excited and send lots of updates, but you're busy and we all get enough spam. However, I do post long after the project's over as a way to share news. If you really want to stay connected, follow our Twitter or Facebook page. We post on those regularly. Fulfilling these rewards is paramount because we value our reputation. There are other games in the works that we'd love to Kickstart but these Kickstarter rewards come first! We have components on hand to build a lot of games and our vendors handle ongoing big orders from us. We've had as many as 30,000 dice in the house, so we're pretty comfortable making big quantities of games. These games are from maker-to-player which means we make them at home. No offshore ordering or import shipping logistics. All components come from US suppliers and we have experience from our previous Kickstarters. We delivered early and plan to do that again. For Mint Tin Mini Apocalypse, Kate and I spent 600 hours making 4,000 games—it's a lot of work but it's very satisfying to share our labor of love with your love of gaming. Yes, that's a good risk and it could affect reward fulfillment. The last Kickstarter showed us that we could get over 4,000 games out ahead of schedule. If this becomes massively successful on the order of many times the funding level, even backup vendors might not be enough. The worst thing that could happen is we'd have to push the delivery back a month or two in order to wait for more skulls to be made. IF . . . we need to do that, we'd honor existing backer' delivery dates and add new rewards with later more accurate dates—that worked well for Mini Apocalypse and backers knew exactly where they stood. With us, our promise to you is the most important thing. PDF download of the high resolution Print-and-Play files for Mint Tin Mini Skulduggery's instructions and quick reference card, and tin, coin, and label art.